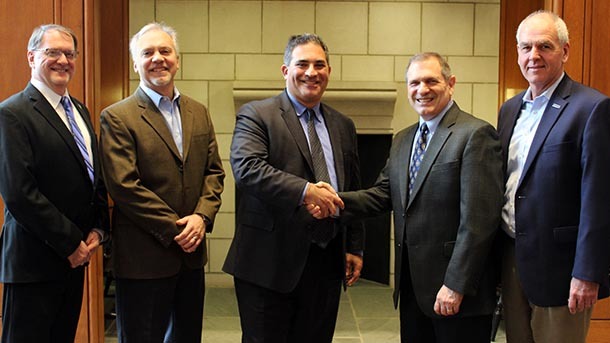 SmithGroup has pledged $50,000 for undergraduate scholarship support in the architectural engineering department. From left to right: Kevin Parfitt, professor of architectural engineering; Russ Sykes, SmithGroup managing partner; Justin Schwartz, Harold and Inge Marcus Dean of Engineering; George Karidis, SmithGroup design director; and Jeff Hausman, SmithGroup senior vice president and Detroit and Pittsburgh office director. UNIVERSITY PARK, Pa. — SmithGroup, one of the world’s preeminent integrated design firms and the longest continually-operating architecture, engineering and planning firms in the United States, has pledged a gift of $50,000 to create a Department of Architectural Engineering scholarship aimed at undergraduate students. The “SmithGroup Scholarship Honoring George P. Karidis, Inventor,” funded by the company’s Detroit office, honors George P. Karidis, PE, LEED AP BD+C, an alumnus of the architectural engineering department. Aligning with SmithGroup’s mission to support the aspirations of architectural and engineering students, the gift will support students’ growth and development as the future leaders of the built industry. Kevin Parfitt, professor of architectural engineering, expressed why he believes the gift will be influential to the department and students alike. As a SmithGroup design director, Karidis is at the forefront of his field. He utilizes his extensive knowledge and experience to create innovative engineering solutions into the design of high-technology facilities. Karidis’s constant dedication can be reflected in his hard work and additional achievements, such as being presented a national ASHRAE Technology Award in honor of his design for the Visteon Village campus, which featured lake-based condensing and a unique linear UFAD system that he patented in 2007. As a part of Penn State’s A Greater Penn State for 21st Century Excellence fundraising campaign and the First-Time Endowed Scholarship Donor Matching Program, a 1:1 matching contribution will be made by the University, resulting in a total endowment of $100,000. The A Greater Penn State for 21st Century Excellence campaign emphasizes fulfilling three core imperatives: opening doors, creating transformative experiences and impacting the word. “Industry-sponsored scholarships such as this are important not only because they help make education more affordable for students but because they are an endorsement of the AE program from the perspective that companies such as SmithGroup are pleased with the quality and preparation of our students. It helps us to know that we are on track with the education we are providing to current students and future graduates,” Parfitt said. With the commitment and generosity of donors like SmithGroup, Penn State will be able to further its historic mission of serving the public good and creating a better future for students, the Commonwealth and the world. Undergraduate students who are pursing or have declared plans to pursue the lighting/electrical, mechanical or structural options in architectural engineering are eligible to apply. 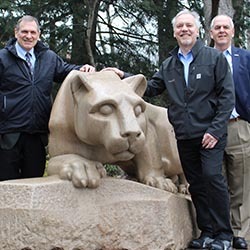 SmithGroup employees George Karidis (left) and Russ Sykes (middle), both Penn State alums, stopped by the Nittany Lion Shrine with Jeff Hausman (right), SmithGroup senior vice president and Detroit and Pittsburgh office director.